I was once in that cycle. I never, ever want to return to anything like that cycle ever again. This is one of those pieces that deserves to be listened to with your eyes closed, giving it your full attention, but it also works quite well as the light background music for a dinner or an afternoon of work. The performers here are regrettably unknown. Few things irritate me more than people tritely suggesting that other people “get a job” or “earn more,” as though it’s as simple as flipping a switch. It’s not. Winter recedes and gives way to spring. Thanks to Russ for the image. Knowing that you have flaws and inperfections makes it substantially easier to deal with the world around you. There’s nothing better than reading something that makes you re-examine the world. Life appears in unexpected places. Thanks to Jay Santiago for the image. I think most of us perceive ourselves to be hard workers, but the reality isn’t in our own perception here. 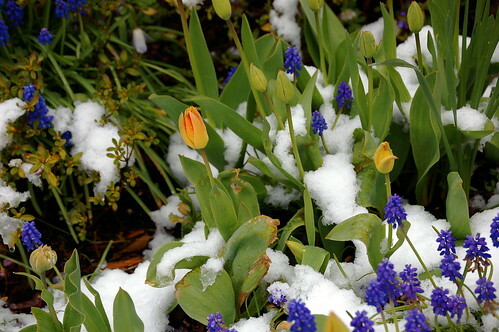 For a moment, spring seems to emerge, then winter returns unexpectedly. Thanks to J.C. Winkler for the image. This is what the best educator does. He or she does something that gets a student to make a life change or to embark on an independent path of study.